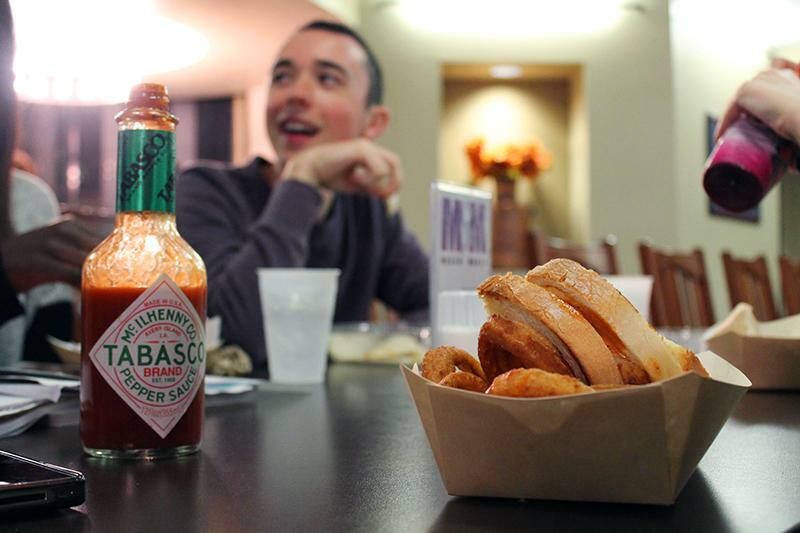 A student eats at Fran’s Cafe. Northwestern Dining cut lunch hours from Elder Dining Hall this year and added taxes to certain purchases. Students will no longer be able to eat lunch at Elder Dining Hall and those without a meal plan will be charged a sales tax at dining halls as part of Northwestern Dining changes this year. After feedback from a survey Spring Quarter, NU Dining decided to eliminate lunch at Elder and replace it with Late Night Dining, available using a non-equivalency meal swipe. This decision, made late June, is because students do not have time to walk up to Elder for lunch during the day, said Rachel Tilghman, director of communications and engagement for Sodexo. Communication sophomore Julianne Lang, who was a Sodexo marketing intern last year, said Sodexo was noticing people did not like Elder and wanted to change it. She said she believes serving late-night at Elder will be popular among students. “I lived in Willard last year and I really loved being able to go to Fran’s late at night,” she said. “I think Elder will be just as successful,” she said. Those on a meal plan who pay for all or part of their meal using a meal swipe, equivalency meals, points or Cat Cash do not have to pay the 9 percent sales tax, which took effect Sept. 1. Previously, all purchases at NU Dining locations were tax free. NU Dining made the change to match Illinois tax laws and billing procedures, Tilghman said. Field said any business open to the public should charge a sales tax unless its customers are on a payment plan or the business is private or noncompetitive. Although dining halls and restaurants on campus are open to the public, the majority of their patrons are students on a meal plan, Field said. Having a sales tax but exempting students on meal plans is a common practice at other universities, Tilghman said. Tilghman hopes to see an increase in usage of Cat Cash, which allows students more purchasing flexibility than meal swipes and equivalency meals and is still exempt from the tax. NU Dining is also considering changing equivalency meals to smart bundles, which would let students buy a full meal at an NU Dining restaurant or convenience store with one meal swipe. They piloted the program last Spring Quarter, however it has not fully taken effect. NU Dining is gathering as much data as possible before making changes, Tilghman said. For this test period, students can now use a smart bundle to pay at Lisa’s Cafe. NU Dining will be meeting with students throughout Fall Quarter to make the campus meal plan more customizable for their needs, Field said. He also said he hopes to develop an off-campus meal plan and a faculty meal plan in the future. “There’s a lot of positive things going on, and a lot of improvements in the quality of the food and the offerings that we have here on campus,” he said.